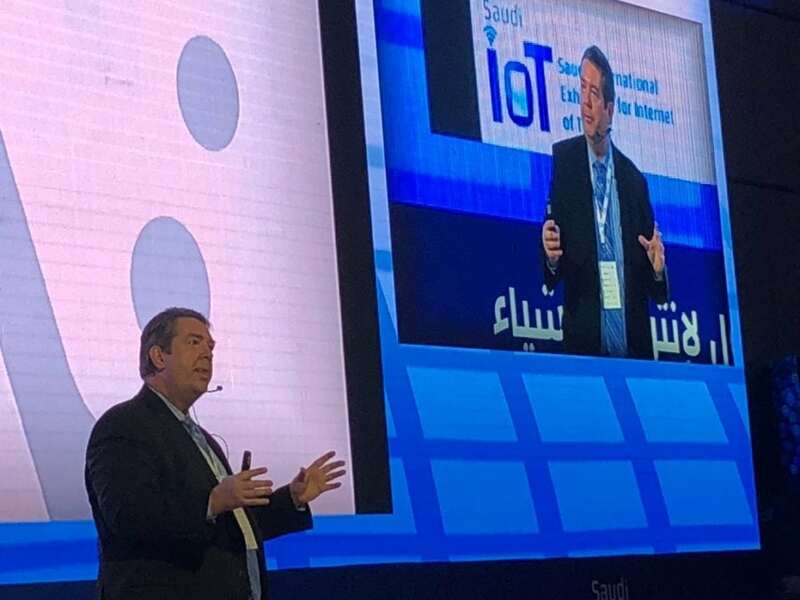 Phil Crompton, principal and founder of Vantage, recently had the opportunity to speak at the inaugural Saudi International Exhibition for Internet of Things. The conference featured more than 80 exhibitors and 30 subject matter experts from within and outside the Kingdom of Saudi Arabia. Phil focused his presentation on explaining how healthcare organizations are planning to incorporate Internet of Things (IoT) technologies into their next generation facilities, and how IoT can be integrated into clinical, information and building systems to improve patient outcomes, enhance staff workflows, and reduce costs. Phil’s first topic was Real Time Location Systems (RTLS). RTLS can be used to locate doctors, nurses and other staff, track patients and visitors, and identify the location of important pieces of equipment. Using customized algorithms to determine specific events, activities and alerts can then be integrated into information and building systems to make RTLS “smarter”. One of the RTLS use cases shared by Phil was how RTLS is implemented to increase the percentage of medical staff using hand sanitizer stations on entering patient rooms. Using Smart IDs and Location Beacons, hospitals are able to track and calculate when personnel visited a sanitizing station. The net impact is that hand hygiene compliance improves by more than 100%, thus improving patient care by reducing bacterial infections. Another example shared by Phil featured Vantage’s work with Sutter Health/CPMC (California Pacific Medical Center) in an IoT Supply Chain Use Case. Sutter Health/CPMC is constructing a 740,000 sq ft, 274 bed acute care hospital in San Francisco using Integrated Project Delivery (IPD). Using Revit Modelling and RTLS integrated deployment, Vantage has worked with Sutter Health/CPMC to simplify the supply chain by optimizing the design, providing real-time budgeting and costing data, and facilitating room-based packaging and delivery of equipment from a staging warehouse. With Revit, Vantage modeled how monitors and other equipment would fit into care stations, treatment rooms and patient rooms. Since there was very little room for staging at the construction site, Sutter had RFID tags placed on key items of incoming equipment in the project’s staging warehouse where it was then sorted, organized and packaged by floor and room for delivery to the job site only when it was ready to be installed. IoT can also be used to create a personalized room experience for patients who need to return to a healthcare facility multiples times for periodic care, such as a cancer treatment ward. For example, a room’s lighting, temperature, entertainment options and décor can be saved and automatically restored to a patient’s saved defaults when they return for additional treatments. These features enable positive distraction therapy, improve patient outcomes and empower the patient and their family to control a slice of their life in an otherwise uncontrollable experience. At Laguna Honda Hospital, a 765-bed skilled nursing and rehabilitation hospital, Vantage used IoT to let the building work as a caregiver. In the Hospital, some of the mobile patients have tendencies to wander which becomes both a safety and a security issue. To help staff manage the location of patients, each at-risk patient wears a badge with an embedded RFID tag. When the patients pass a sensor indicating that they have strayed, a speaker will play a pre-recorded message from someone they know to gently remind them to return to their room or safe area. If the patient ignores the message and continues to move away towards the exit, an alert is sent to the nursing station. If the patient makes it to an elevator, the elevator doors are programmed not to close with the patient inside. Another possible use is the case where two patients may not get along and may become confrontational. The system is programmed to alert staff if such patients enter the same space so the staff can take proactive measures before a negative encounter occurs. Turning the building into a caregiver allows staff to focus on high-value tasks while the systems monitors the relatively low-value task of managing the location of patients. This also improves patient safety and provides family members with a sense of security that their loved ones are safe while delivering valuable clinical data regarding the recovery state of each patient. By embedding IoT sensors into the home, Phil explained how hospital coverage can be extended while reducing the need for full-time care in a medical facility. Sensors can monitor health, share vitals with the doctor, remind patients to take medicine, track recovery and use predictive analytics to preempt emergencies. IoT Extends Healthcare Into the HomeTechnologies such as Amazon Alexa and Google Home are already incorporating many features that can cross over into the healthcare realm. Information from WebMD is currently available via Alexa and some hospitals are running pilot programs where patients can query Alexa with health questions and health providers can ask questions about protocols and other clinical information. Many patients will see reduced recovery time and improved outcomes with home-based IoT while getting quality healthcare at a fraction of the cost of a medical facility. To learn more about how Vantage is incorporating IoT into the next generation of hospitals and medical centers, contact us for an in-depth discussion of our capabilities and how technology can be applied to support workflow processes and enhance patient care. Vantage specialized in strategic technology planning, system design, technology project management and transition planning.